I was asked to make a 2019 wish on behalf of all the listeners of Feminine Foresight, a podcast for which I was recently interviewed. My response was simple. I wished that we could all re-imagine ‘enough.’ Are you enough? Maybe you haven’t thought about the question in quite that way before. Even so, I am fairly certain that you have experience with it or one of its popular cousins. Are you smart enough? Talented enough? Connected enough? Slim enough? Fit enough? Attractive enough? Kind enough? Driven enough? Supportive enough? Good enough? Happy enough? Tough enough? Successful enough? Present enough? Loved enough? Loving enough? My personal favorite – in case you are wondering – hails from the good enough arena. Will I ever be good enough? Or more precisely, will my work ever be good enough? My interviewer’s question made me realize that I’ve had enough of all this. Have you ever wondered what might be awaiting for you on the other side of enough? With Valentine’s Day approaching, I thought I’d explore a concept we don’t talk much about. Love. What comes to mind when you hear the word? Hallmark, Amazon and 1-800-flowers would hope that cupids and red roses and chocolate are somewhere in the mix. A recent story I read compelled me to look at love differently, from an honest and often hidden perspective. It centers on how we express love in the normal course. Can name a few ways that you do? A pic from one of the ways I express love – talking about my fav topic transition – is below. When was the last time you took a new step? Sounds like a funny question, doesn’t it? New steps can take many forms. Yours might be tied to finally having a long-dreaded conversation about ending your relationship with your spouse or partner. Or yours might be finally registering for that course to help you begin to track your career in a new direction. Or, like me, yours might be tied to having a long overdue conversation with my 85-year-old mother about her continuing loss of function and skyrocketing care needs. While these may sound like vastly different scenarios, transition has taught me that they are all versions of the same theme. Each requires us to begin. To take a new step. To act by relying on a set of beliefs that are tied to who we are and how we make meaning in the world. Each one asks us to head in a direction whose outcome is uncertain. To embrace an unknown or unknowable destination. This journey – into the unknown – fascinates me. My knowledge of transition has helped me walk in this direction. I’ve benefited greatly from it thus far and still consider myself a traveler. One thing I know for sure. We greatly misunderstand transition as a society. In fact, we’re socialized to head in the opposite direction when we face uncertainty. This detour can be costly to us and to those who rely upon us. My work is all about dispelling this confusion around transition and helping people live the lives they only imagine. To support my work, today I introduce my new podcast, Destination Unknown: a field guide. Its sole purpose is to dispel the mystery surrounding transition so that all of us – no matter the particulars – can take the first step, and then another one, successfully. Destination Unknown: a field guide (available on iTunes) is designed with you in mind. It features 15-minute power conversations between yours truly and those navigating all manner of transition. Our first episode features Leona, a 50 ish year old career enthusiast who decided to head in another direction. Leona talks about how difficult it was to make the decision and how she did it. What can you expect if you find yourself at a crossroads? Maybe you have an idea of what could be ahead but not much more than that? What are the murkiest parts of the journey? Are there patterns to be aware of that can help redirect my energy in positive and important ways? If you’ve ever felt nauseated, discombobulated, or panicked about a new step, you’ll find something important in our first episode. Why is this podcast different? I know what you are saying, ‘not another podcast!’ Destination Unknown: a field guide is a resource for everyone in or considering transition. It will introduce you to the scary parts of the movie before you find yourself in a theater all alone. For anyone who has seen the Exorcist or Nightmare on Elm St, remember that once you are familiar with the really scary scenes, you experience the movie differently. You see new things. You access new parts of the plot that you overlooked in your earlier panic. So too, transition. Learn how to navigate it successfully with Destination Unknown: a field guide. I hope you’ll join us. Please take a moment to subscribe to Destination Unknown: a field guide on iTunes and tell someone you know who might benefit from its message. For those wondering about my 2019 imagined possibility test, I’ve made it two days so far. Even so, I am improving. I catch myself when negative thoughts hop into my head. I cannot say that I have made much more progress than that. I haven’t given up. I continue undaunted. Beginning a new step each day. May you always be drawn to journeys that can lead you in a stronger, more beautiful direction and may you always find the courage to take the next step. Thank you for your unending support of my journey. Copyright © 2019 Linda Rossetti & NovoFemina.com. All rights reserved. No content on this site may be reused in any fashion without written permission from NovoFemina.com. A belated Happy New Year! I am kicking off ’19 with an important new experiment. I want to walk in possibility – daily. Most of us recognize that the world is full of possibility. But I wonder how many of us recognize that this statement is also true for each of us individually? A world of possibility is resident within all of us. Are you ready to bring it forward? What might it look like for you? Perhaps ’19 is the year to bring shape to what possibility might mean for you. Sounds funny, doesn’t it. Walking in possibility. The phrase came to me as I was taping a show for my upcoming – soon to be released – podcast, Destination Unknown: a field guide. One of my guests talked about the energy she derived from ‘living in possibility’ instead of ‘living in fear.’ She was able to feel the difference. Fear for her was very real. It emanated from her desire to make a career change after thirty years in an industry. My desire to walk in possibility brought me to my experiment. Unlike my guest, I was not able to see fear as my driver. Instead my gate to possibility lives in the voices inside my head that battle with me by diminishing, devaluing, derailing possibility. This symphony is a constant companion. You see I am the champion of private highly-damaging monologues. These thoughts can creep in from any front; work, parenting, relationships, elder care. No sector is off-limits. My experiment for 2019 is centered on eliminating the barriers that stand in the way of my possibility. I want to go five days straight without a negative, critical or self-limiting thought deflating my sense of self. Any time I fall off the wagon, my five day count will re-set. I have 365 days with which to pull off this consecutive five day cycle. This goal is tricky. I may not be able to stop these thoughts from entering my head. But to move forward any one day I need to change the way I respond to them. How hard can this be? You may ask. It feels like an eternity from where I sit. For those wondering about my progress, I haven’t gone two consecutive days yet. We are roughly ten days into the year. Here is a great example. Last week I talked with a handful of career coaches to test a business idea I have been toying with for some time. I’d like to run continuing education courses for professionals, like financial planners or career and life coaches. I plan to share my research and, most importantly, my exercises. All of those with whom I spoke were interested in the idea. Can you guess what happened next? My lovely inner voice discounted the avenue…..entirely. My guess is that I am not alone in this type of cycle. For my experiment to work, I need to recognize an inbound nasty gram and I need to tag it as such. Irrational. Highly circumspect. I can no longer allow these thoughts to take root, change my mood or – most especially – convince me that my idea or desire isn’t worthy. Yes, five days really does feel like an eternity…. Possibilities live in transition’s zip code. Our dreams are imagined possibilities. They serve a crucial role as we navigate shifts in transition. Through possibilities we envision, architect and begin moving forward. If you decide to venture forth in possibility, what would you expect to encounter along the way? Maybe the answer to that question can lead you to an experiment, like mine, one that will help you see possibility in an entirely new light. May ’19 bring you the courage to walk in your possibility and to greet with an open heart all that you encounter along the way. By this time – many years into solid research on transitioning – one might imagine that I’ve learned all there is to know about the topic. I was reminded after my recent trip to San Francisco of how untrue this line of thinking really is. I am happy to report that I returned from California dry-eyed and excited. For those who missed Remarkable Choices, I spent three-weeks in San Francisco this summer on a writing vacation. My goal was to work unimpeded on my second book. I am happy to report that by the time I checked in for my return flight, I had an entire manuscript drafted, from introduction to final chapter. That said, the new manuscript isn’t the entire story. The trip yielded something even more special, a broader perspective on my work. This expansion starts in a place with which we are all familiar, a decision to leave. We leave all sorts of things. We leave in big and small ways. We leave family gatherings and political rallies and baseball games. We leave marriages and employers and friendships. We leave one opportunity for another more promising one. We leave anger and guilt and self-doubt for hope. When do we leave ourselves? San Francisco brought this question to light for me. Those who know me personally know that I am a process wonk. Therefore it shouldn’t surprise anyone that process was on my mind as I readied myself for the trip. Ok, it wasn’t until I was on the airplane heading west that I created a plan. But it was an important step. Would I follow the same writing process I used with my first book? Or try something new? In the intervening years since my first book was published, a friend gave me a great book that talked about a radically different approach to story development than the one I had used earlier. I toyed with adopting it but I was hesitant. The last thing I wanted to do was waste my time fooling around with something that would be unproductive. But what about taking a creative risk? What might be possible under that scenario? I settled on the unproven new approach. The process had three basic steps: to create a one page description of the book’s theme; to develop a detailed chapter outline; and then, and only then, to write chapters. In spite of my hesitation, the new process proved to be surprisingly useful. My work is about choice or the difficulty many of us have – including me – in making significant choices or major life decisions. I was – after all – introduced to transition thanks to a personal calamity that left me struggling with a choice of what to do next. By focusing on choice, I realized that transition is not an end in-and-of itself. Transition is a process that enables growth. Our own growth. Nothing requires us to transition. It is a choice we make. We choose to grow. We encounter many many invitations for growth over the course of our lives. Oddly, we ignore most of them. In fact, we live in a growth-phobic society. Our social norms teach us to look the other way, tamp down or create distractions when faced with an opportunity to grow. These norms leave us busy – sometimes exhausted – but no further from a growth perspective. Once we recognize the opportunity for growth and the capacity for growth that transition offers, we learn that the secret sauce lies in ‘how we respond’ to all of this. Our progress forward relies heavily on our ability to rewire our response to a transition’s trigger or the barriers and emotions that accompany them. Triggers or the circumstances that lead us to choose growth vary widely. Divorce, death, job loss, marriage, the birth of another child, gender re-assignment surgery or a recognition that something isn’t quite right. Transition doesn’t concern itself with differences among triggers. The common denominator in all of this is a shift, a shift in what holds value and meaning to us. The shift occurs when we re-examine our assumptions about who we are and how we make meaning in the world. On a practical level growth is simple: we need to turn up the volume on those things that hold value and meaning to us. These things can be anything on the planet as long as they engage us at the core. By giving voice to these things that matter to us, we allow ourselves to see the path forward in an entirely new way. With this as a ballast, all of a sudden options that were hidden from us come into full view. What About Leaving and Leading? When most of us think about transition, we think it involves leaving something. Leaving a professional identity or a marriage or a dysfunctional familial relationship. San Francisco taught me that this departure thinking is incorrect. Transition and growth are about leading with who we are….ourselves…in all the circumstances of our lives. Not just at work. Not only on the playground or in the kitchen or with a sibling or a dear friend. Leading with you. Your beliefs. Everywhere. Even if this involves a struggle to recalibrate who we are thanks to a previously unrecognized departure from ourselves. This type of leading may involve leaving but it doesn’t have too. If we decouple leading with leaving, transition and growth become universally available. Through this lens, transition cannot get waylaid by the mortgage or a un-supportive boss or an overbearing family. We get to decide how we show up every day. You don’t need to leave to lead in this way. The converse isn’t as kind. You can leave – repeatedly – and never make a dent in transition nor growth. You will miss all of the benefits of transition and growth if you leave something but do not use your departure as an opportunity to bring up the volume on those things that hold value or meaning to you. Leaving is often hard. Imagine if it yields nothing related to our own growth…. Transition has allowed me to grow in ways I never imagined. I now operate with a connectedness to who I am that I never knew was missing and yet I can honestly say that it completes me like nothing else ever has. It is an awakening that makes me feel as if I am breathing from every pore on my body. Energetic. Joyful. Free. May you see opportunities to add who you are to every moment that you are alive. May you respond to the invitation for growth with an open heart and begin a remarkable journey whose destination while unknown is irreplaceable. May you realize that you can have all these things by simply leading with who you are. Today. Want to talk ‘live’ about transition and growth? There are two ways you can join me for informal chats. For those in and around Boston, join me at a free drop-in series In Transition at the Winchester Public Library on the second Thursday of every month from 7-8:30 pm. Free coffee and refreshments are served. Our kick off for this season is Thursday, September 11th! Hope to see you there. For those unable to join in person, watch for my inaugural podcast, Destination Unknown, starting this fall. Will you join me to talk about your transition? I am scheduling guests now for twelve-minute appearances. Email me if you are interested. I’d love to add your voice to our conversation. 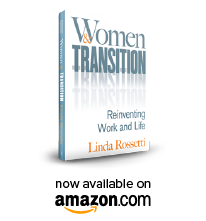 linda@womenandtransition.com. Tears come easily today. I wonder about them. I am sitting in San Francisco thanks to a long-awaited three-week writing vacation. I am house sitting while a friend and her husband travel. I am writing my second book, a non-gendered view of transition. My teenage daughter helped me create a calendar with daily writing goals. My son promised to FaceTime daily with a few good jokes. I hope to make real progress. But the tears? Where are they coming from? Have you ever had a day when emotions reigned unchecked? I have two theories about the tears. The first is all about fear. Am I afraid of the work or of not being able to make progress? Possibly. By being here I’ve removed nearly every barrier that I believe gets in the way of my writing. Here there are no meals to prepare; no scraped knees to comfort; no laundry; no conference calls; no carpool coordination; no driving a child here or picking another one up there; and no elder care responsibilities. There is a market on the corner and a breakfast joint a block away. I’ve made a note to ask tomorrow if they deliver. In spite of barrier-less living, fear is very real. Am I afraid of what I can do? Or afraid of what I cannot do? My performance fear may stem from the fact that it takes me a long time to write. For years I was told that I was a lousy writer. This messaging happened repeatedly from high school through college and into my early working life. It seems to me that this characterization had more to do with the topics I was asked to write about – like the gross margin performance of a business – than my desire to write. Whatever the reason, the negativity of this descriptor has had a lasting impact. That said, I do not think that I can credit fear for my tears. My second ‘tear’ theory is related to my transition’s current state. My new status has brought with it peace but it has also hit some very emotional chords. When my trigger first occurred, I had no vocabulary or understanding of transition. I recognized that there was a mismatch between what occurred – a childcare snafu while on a business trip to London – and how I felt. I felt as if the ground fell out from underneath me. I tried to hit the re-set button which would allow me to just keep going. It did not work. Nothing did. I felt ashamed because I didn’t know what was going on; I was engulfed in self-doubt thanks to the enormity of what I was feeling; and I felt alone. Very very alone. It would take hundreds of hours of conversations with others who were going through significant changes for me to realize that I was transitioning, a normal process of growth and development that is available to all. Here is the kicker. We grossly misunderstand transition in our society. Transitions occur when there is a shift in what holds value or meaning to us. It can happen at 22 years of age or 72 years of age. Or never. In fact, the great majority of adults look to distractions to keep themselves away from this very real opportunity for extraordinary growth. At its core, transition is about choice. Choosing to grow. What will we do when faced with the need to change? Some cling to the status quo, some retreat to an earlier more comfortable state, others pursue all manner of changes. Still others decouple from all or part of their known identity and walk forward into uncertainty. These hearty transitioners make the choice to explore more of who they are. It is an act of courage that offers an ever-expanding opportunity to engage who we are with the world. Over the past six months I am all of a sudden aware of the role that emotional connections play for me. I have a deep desire to be connected to others. What if my feeling alone all those years ago had nothing to do with my trigger and more to do with the emotionally vacant environment I’d excelled in for decades? Did I mention that for nearly 25 years I thrived in a business world where I was rewarded for silencing emotions? Back to the tears. Somewhere deep down I know that the way forward for book #2 is the tell the story of transition through my emotions. I think the tears are related to standing at a cross-roads: I can rationalize what I need to do, but I still need to re-direct the anti-emotional patterns so long-established in me. How will I dismantle the last remaining pieces of the force field I’d built over so many years? Today, I feel as if I am making a remarkable choice. I am deciding to continue. To trust the process of transition as I re-examine my identity through emotions and my connection to those around me. I am uncertain where it will take me but I know that it will engage my voice in an entirely new way. Wish me luck as I try to conjure that part of my spirit that wants to celebrate this unique opportunity to write. Say a little prayer that I give in to the creative process without judgement or filter. Thank you for walking next to me through this process. Your presence is an incredible gift and one that I rely on more than you know. If you have comments or ideas, please comment below or send me a note at linda@womenandtransition.com.